According to the very well done book "A-Z of Analogue Synthesisers" by Peter Forrest, this little thing was built from late 1975 till 1978. It was available in a metal stage and a more organ like wood housing version. Here you see the wooden version. It is built from chipboard covered by real veneer that looks like cherry wood to me. Only the vertical stripe above the keyboard action is real wood. The bottom plate is identically to the metal housing version. That is why one finds there some clips to attach the note book holder (made of a thick chrome covered thread) of the metal housing version there. The front and the housing left and right the keyboard are made of metal. Overall it is a nice housing and my unit appears to be in a great condition. Mainly because the now about 60 year old original owner was physically unable to play this instrument from the early eighties on. So what does this little thing do? And you have the switches to mute ("Cancel") this section, turn the vibrato on/off and switch on/off the delay FX of the vibrato. That's all for this section. The quality of these sounds appears more "realistic" then the Moog Satellite to me. But still only approxemations of the real things. You can think of these as the octave and waveshape presets of this instrument. The note priority is highest note single trigger. By switching on (=down) the very left switch tab, the sounds will get a decay and won't sustain enless while holding down a key. It also adds a release about the same lenght as the decay. This sound familiar to a Minimoog user. The vibrato - sharing the same speed slider as the poly section - features its on on/off switch and delay switch in the left hand section. Again we have a mute switch. And of cause a Volume and Brilliance slider. But what the heck are the very right things on the left hand section doing? Well, first there are two sliders for the envelope. One called Soffiato (italian for "blown") and changes the attack from zero to a max of about 500 msecs. And a Decay slider (guess what it does!). The Portamento slider is the second slider from the right on the left hand section. No need to explane this. And then there is a rotary 4 stop switch and a little slider. 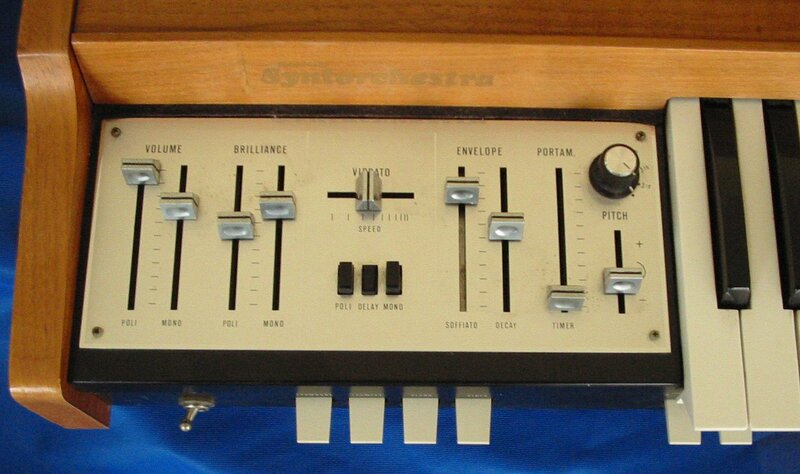 These controll the tunning of the mono section relative to the set main tune of the poly section in the back. The slider fine tunes it. And the rotary switch allows to transpose the mono section down by a 3rd, 5th, 6th or zero (no transpose). But now to the most synth like sounding control. It is hidden under the name "Wha-Wha". actually it does not what you might think if you read its label. It adds a rather well resonating filter to the mono section. Here is it where the fun starts! You get a wha-wha FX if you use the vibrato together with this FX tab switch. But if you use the Decay switch and the Decay slider together with the Soffiato (Attack) slider, you get some very nice filter sweeps. Sounding really like a simple but well done synth. See the link to the sound examples below to get an idea how it sounds like. The Portamento can be switched on permamently or switched on temporarily by the very huge Portamento tab in the middle below the keyboard action. On the back of the instrument you find a DIN connector for the included volume pedal (working on both sections all the time). A mono section out. It doubles as poly and mono out if the poly output is not used. because of this individual outs, this Syntorechtra was labled "Stereo Synthorchestra" on the wood just above the left hand metal panel. Wow! In the back you have a little trimmer to tune the master secttion. And the Monotrack trimmer is used to scale the mono section to the keyboard tracking of the poly section. Because of the clock divider technic of the poly section (as used on most organs before they went digital) there is no keyboard scalling problem in this section. But the mono sections apears to have some temperature drift problems. So better switch it on a few minutes befor enjoying this thing. The switch visible at the very right under the keyboard is the mains on/off switch. The switch on the left hand is a modification done by the original owner. It turns off the mono section's foot volume control.